:: I’m just wondering if there isn’t space in this world for more than irony. And cruelty. I traveled by train to Washington, D.C., mid-week this week for work. Union Station in D.C. is under construction, but it is still a beautiful building. On Thursday, I had some time to spend before catching my train home, so I wandered around the buildings near Union Station to be touristy for a bit. I saw some benches sitting in a gorgeous patch of sunlight. Then I noticed that something looked off, like an M.C. Escher sketch. 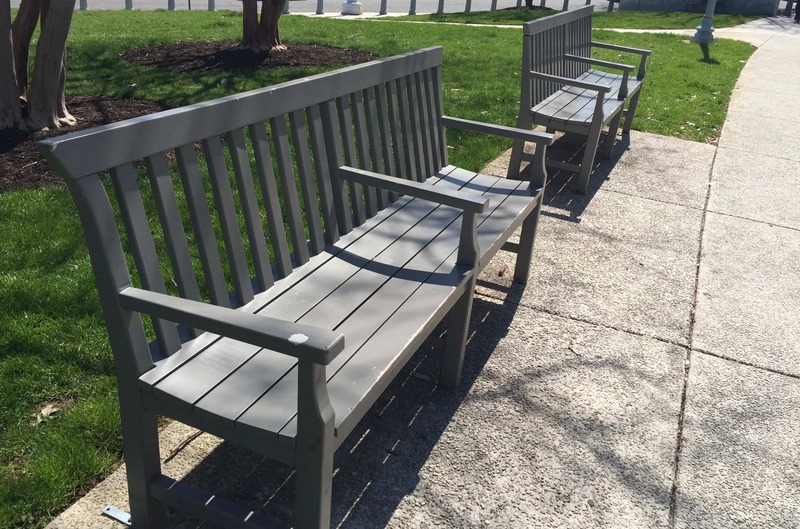 Each bench had an extra armrest in the middle—a hostile, tacked-on appendage. Please. I could quote the Bible (How we treat the least of these… etc. in Matthew 25). I could point out that the property those benches sit on is quite literally, in the most denotative sense, public property. The problem, of course, is that homeless people are, to folks like city mayors, scary, unsightly, and not conducive to raking in tourist dollars. Now, when you want to rake in the tourist dollars, THIS is what you do. 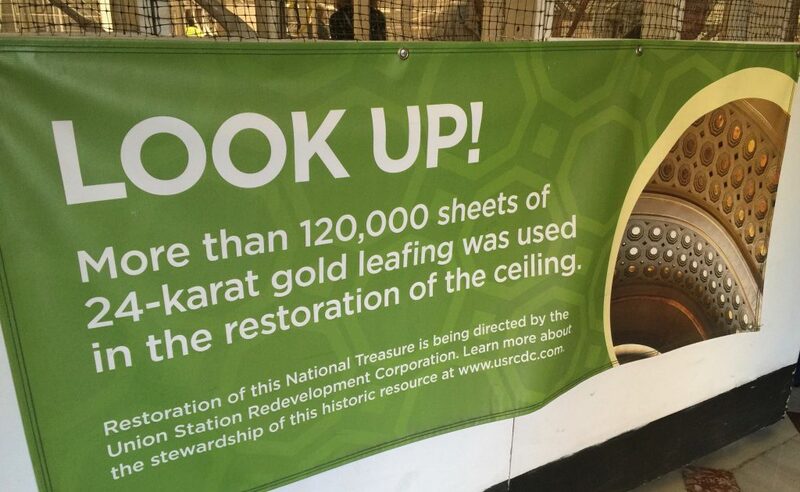 You purchase 120 thousand sheets of 24-karat gold leafing to re-cover the ceiling of the adjacent train station. I’m not saying the ceiling of Union Station isn’t beautiful. Look. It totally is. 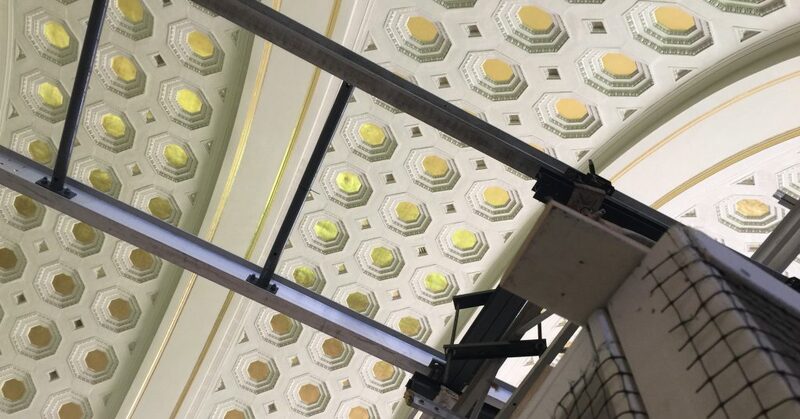 Alt Text: Photograph of the gold leafed ceiling of Union Station in Washington, D.C., with scaffolding in the foreground. I’m just wondering if there isn’t space in this world for more than irony. And cruelty. The unbelievable expense of coating a ceiling in gold. The worthlessness of a human body searching for a place to sleep.